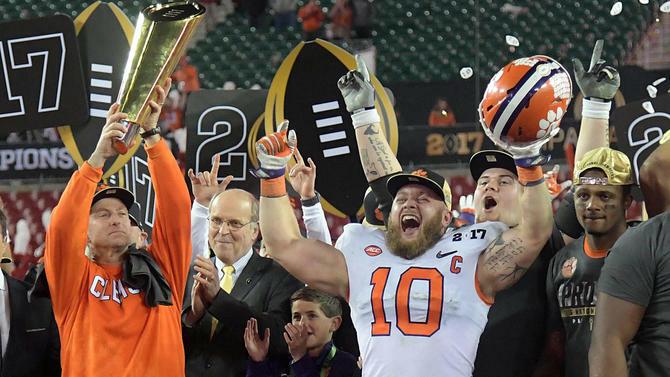 In a game for the ages, against an opponent as vaunted as any before it, Clemson elevated itself to the most rarefied of positions Monday night in the national title game: to a spot not just among fellow national champions but, more remarkable, among the elite of the elite. Alabama. Ohio State. Michigan. USC. Notre Dame. And now, beyond a doubt, Clemson. In a stunning and gripping national championship game against Alabama, Clemson pulled off a riveting 35-31 victory with a mere second to go. They say to be the man you gotta beat the man. Well, Clemson did just that, pushing aside an Alabama team that many argued was at least on paper the greatest in college football history and, in doing so, branded itself among the new elite in college football. “You can’t make it up, man,” Clemson coach Dabo Swinney said after the game with tears in his eyes, and was that ever true. Clemson overcame two early and potentially disastrous turnovers. They overcame a shocking Alabama blitz at the end of the game that seemed to have given Nick Saban his sixth national championship — a flash of changing momentum that went from a fourth-down conversion to a patented Jalen Hurts 30-yard touchdown scramble that turned an already frenzied game on its head, again. Then Clemson overcame 68 yards and a fleeting 127 seconds to bring it home. They scored with a single, solitary second left against a defense for the ages. All season, while we were talking about Harbaugh and Saban and Meyer we should have been honing in on the rising greatness of Sweeney and what he has built at Clemson. While too many of us were pushing for Penn State or Michigan at the expense of Washington or, yes, maybe even Clemson (guilty as charged here), we should have realized the Tigers had turned itself into a program that can stand with any other. Deshaun Watson is a machine, a poised and dangerous weapon that had been here before. Clemson rolled out a receiving corps as dangerous as any in America, and maybe ever. They put 420 passing yards, 511 total yards and 35 points up against one of the most dominant and talented defenses in the history of the sport. Clemson’s program is as good as any other in football. It’s easy to forget now, but last season they led into the fourth quarter against Alabama in the title game only to fall 45-40. But even that loss set the table — and resume — for this Clemson team and how we should now see them. And they did it against — still — the greatest college football coach of all time. Entering Monday’s instant classic, Saban was 12-1 in championship games and 5-0 in national championships. While Bear Bryant still has sixth titles, and Saban remains at five, the Crimson Tide coach had already established himself as the greatest college football coach of all time before this season even began. Yes, Saban rolled into a national title game by subbing out the season’s offensive coordinator, Lane Kiffin, for Steve Sarkisian. And yes, Alabama lost its star running back, Bo Scarbrough, toward the end of the third quarter. No matter, no excuses, no asterisks. This is football, and the scoreboard tells the story. And Alabama still managed to take the lead with less than three minutes to go in the game on Hurts’ incredible scramble. And then Clemson, its season on the line, its heart on the verge of being broken, marched right down the field against the best defense of all time, and the greatest college football coach ever, to get it win it all. That’s the stuff of greatness. Time changes, and history, plodding along, can take sudden and unexpected turns. Texas and Nebraska have lost some of their shine. And in their place a team was bound to rise. That team is Clemson, and it’s time we start talking about them with the same awe and respect commanded by the other so-called elites of college football. Previous #GoldenGlobes 2017: Complete Nominees and Winners List!